This serum is something I currently need as I’ve been doing at-home dermal rolling using 1.5mm needles for a while now. This length can be very uncomfortable and usually requires numbing cream. I’m not going to review or show how to do this at home as it’s very easily done wrong and can cause a lot of damage – I don’t want to be responsible for you putting needles in your face and it going very wrong. In essence, dermal rolling creates micro incisions in the surface of the skin. When the skin then repairs, it’s tighter whilst collagen and elastin production is noticeably boosted. It’s great for wrinkles, scarring and poor skin texture. 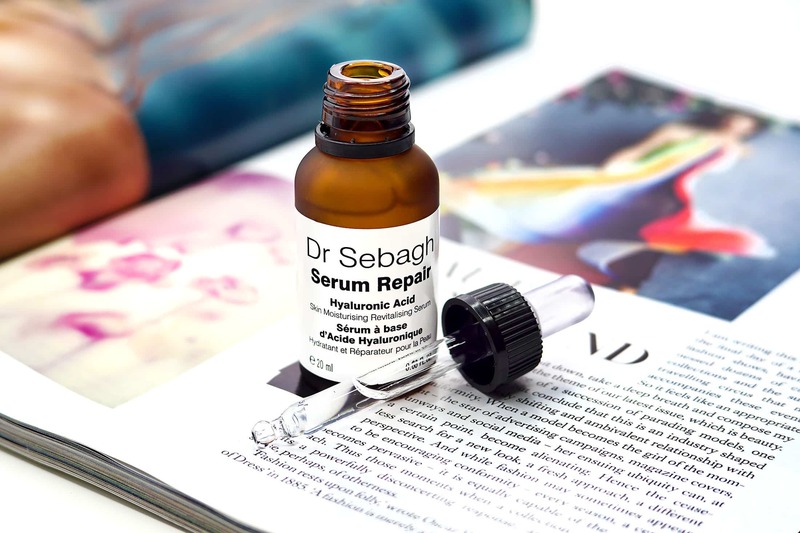 Once you’ve finished a session of treatment, using a relatively pure Hyaluronic Acid serum like the Dr Sebagh Hyaluronic Acid Repair Serum is what’s needed (only!). 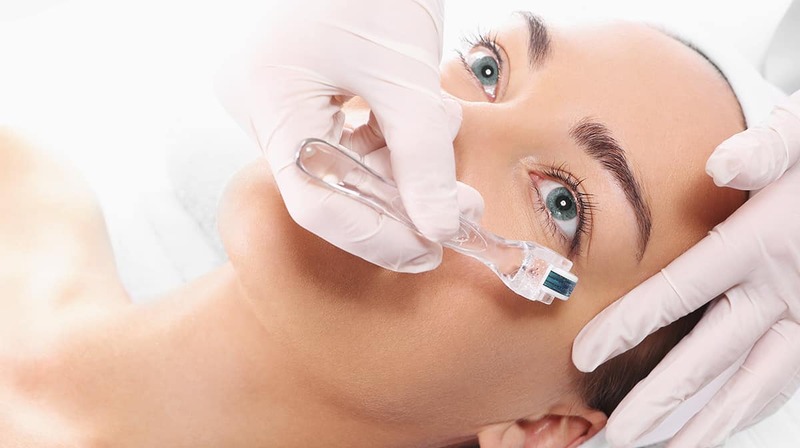 If you like the sound of dermal-rolling, do not do it at home unless you know what you’re doing; you can get this treatment done by most professional cosmetic aestheticians. 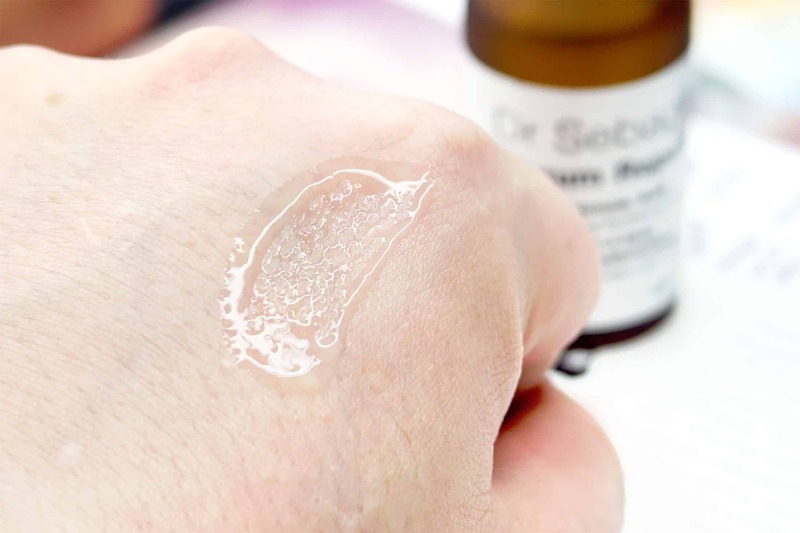 So the Dr Sebagh Hyaluronic Acid Repair Serum is a very lightweight serum made of Hydrolyzed Collagen, a deeply hydrating collagen peptide that along with the help of Hyaluronic Acid, penetrates hydration deep into the skin’s surface. Glycerin also helps to soften the skin’s outer-most layers. This serum is very, very lightweight and cannot be used to moisturise with on its own. Applied under your standard moisturiser both day and night, this will boost its hydrating powers. For me, I even use this underneath my treatment serum and then add my moisturiser over that; all without any sort of product build up. This will increase skins plumpness as that non-greasy moisture is forced in there. Particularly around any areas such as wrinkles or pot-marks, it will help to fill out those areas slightly, but it’s ultimately a skincare product so expect some results, but not miracles. You can see in the image above how in the very, very short time it took me to swatch and shoot that image, my skin had already started to drink it in. An all round quality serum, well formulated in my opinion and delivers only the hydration ingredients you need. As mentioned, combine this into your existing skincare regime as this won’t target concerns like discolouration, blemishes, sagging etc; but a healthy moisture barrier makes for much better behaving skin! This article first appeared on MANFACE written by Thom Watson. It was published on Friday 21st April 2017 and was last updated on Friday 21st April 2017 at 11:28pm. It's categorised under Combination Skin, Dr Sebagh, Dry / Dehydrated Skin, Oily Skin, Serums & Treatments where you'll find more related content. This is a fab post! I recently ordered some amazing aloe skin care products from Forever Living, they have really helped with my dry skin! A lot of people recoil as soon as they read the word “Acid” when it relates to these products, but this looks like it’s worth a try. Thanks! It’s an acid only in the way it corrodes and immediately bonds itself to cells forcibly delivering oodles of moisture. One of my all-time favourite ingredients!